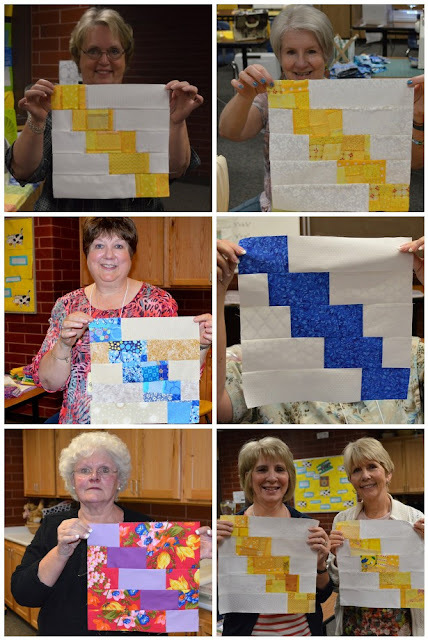 Happy Quilting: Panguitch Quilt Walk!! June 11th to the 13th was the annual Panguitch Quilt Walk Festival and I had so, so, so much fun!!!! I spent most of my time there in this fabulous classroom. The Festival is held in the local high school which makes for lots and lots of class space, and I just love that!!! Everyone set up and got to sewing!!! My first class on Thursday was the End of the Rainbow class, which is the cover quilt on my Irish Chain Quilts book ;) This class was so much fun!!! We were slashing up scraps and crazy patch piecing and having an all around great time!!! And everyone made some fantastic progress. 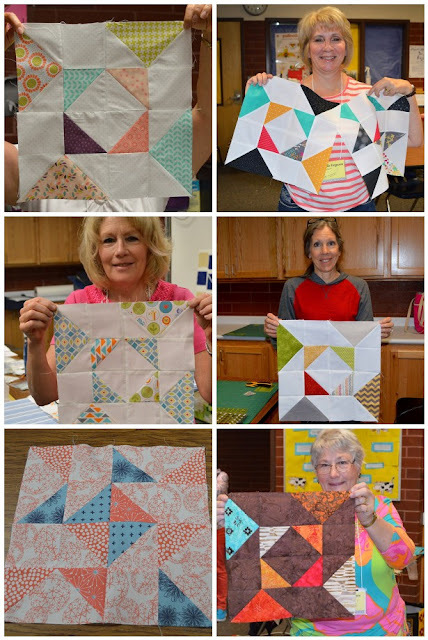 Here are a few finished blocks from the class. Then that evening, I taught my Daisy Chain class, one of the quilts from the Appliqued Chains section of Irish Chain Quilts. Several people in class were doing applique for their first time and it was so excited to see their eyes light eye when they finished their blocks. One gal said, "seriously, it's that easy!!!" And I said, absolutely it is and oh so much fun!!! Didn't their blocks just come out darling!! Then on Friday morning I taught my final class which was Back to Basics ;) This is such a fantastic class for teaching the basics of HST's and Flying Geese!!! Everyone really enjoyed it and I just loved seeing all the different fabric choices of everyone. So cute!!! Then Friday night I had off and went to visit the kids who were camping near by. Saturday morning I was so excited to be shown this fantastic finish!! One of the gals in my End of the Rainbow class had finished her quilt top!!!! Isn't it just stunning!!! I love all of the different tone on tone prints she used in the background. Just fabulous!!! And then, Saturday afternoon I got to do an Irish Chain Quilts Trunk Show!!! I will admit, I was a little nervous before I started. They had me up on the high school stage and the room was packed!!! 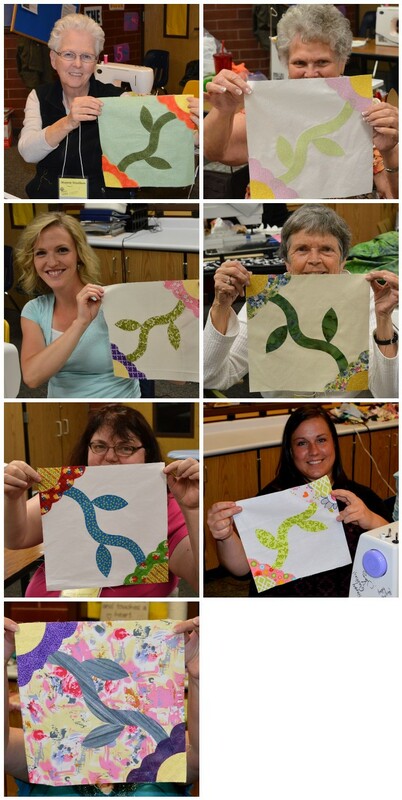 But, like always, as soon as I started talking quilts, all the butterflies flew away and it was oh so much fun!!! I started off by sharing a little Single, Double, and Triple Irish Chain action including the Double that my mother made me that was the inspiration behind the book. And from there we led right into the quilts from the book. It was so much fun to be able to walk through each of the quilts in the book and share my inspiration behind them, or how I made them, or fun ways I quilted them. Each quilt just seemed to have it's own little story that needed to be shared. I just love that about quilting. You don't realize it, until you stop and think about it, but each quilt I make is special in it's own way for one reason or another. And, I have to admit, nothing makes you feel better than when someone opens your quilt and a whole room does the Ohhs and Ahhs. Yup, I was floating on Cloud 9. And before you knew it, I was to the last quilt in the book. It went by so fast but it was just so much fun!!! And afterwards, I let everyone come up and check out the quilts while I signed books. I have to say, I loved every second of it and I can't wait to do another trunk show!! So, So, So much fun!!! Thank you so much to the ladies of the Panguitch Quilt Walk Festival for having me!!!! It truly was amazing!!! I know I say it every time, But I just love to teach!!!!! I always come away from it just feeling so full of love for quilting and quilters!!! They really are the nicest people in the whole wide world!!! How fun, some day hope to go to a class. Everyone did a great job on their blocks. So glad that you had a wonderful time. I really enjoy seeing the quilts that you have designed and made. One of the greatest parts of quilting is that every quilt is different and like you mentioned has its own unique story. Thanks for sharing and designing/creating this book. Have a great day! That is so nice that you could fill a big Room and share your Quilts story. Sharing the stories is just one of my favorite parts of quilting.